Guam houses for rent come in variety of locations, prices, sizes and views. There are quite a few Guam houses for rent in every village ranging in price from $1,000 all the way up to $7,000 per month. In recent years there have been quite a few new houses built in Guam, with many of them available for rent. Take a look on our website or ask us about the new Guam houses for rent. 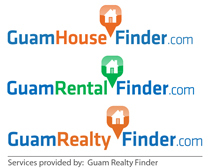 GuamHouseFinder.com® is a service provided by Guam Realty Finder, the Guam leader in online real estate services. Guam Realty Finder is a division of Finder LLC.The information on this site is in part provided MLS(Multiple Listing Service) of the Guam Association of REALTORS©. All information provided is deemed reliable but is not guaranteed by Guam Realty Finder and should be independently verified. Site visitors are encouraged to contact a real estate agent at Guam Realty Finder for more information. © Copyright 2011-2018 Guam House Finder. All rights reserved. Contact Us.